When you get what you pray for | spifftacular. Oh, this made me cry. Thank heaven (literally) for being able to pray about difficult times with babies. Or, really, difficult times in general. But for real, with babies. Watch out world, Katie may be converting! I have prayed nonstop in the last (how pregnant am I?) 29 weeks for my child to sleep just a little more so that I could get enough sleep to sustain this beautiful life growing inside of me. Thad has laughed in my face every morning as he was up before the sun and his naps got shorter and shorter. I’ll keep praying for sleep, but at this point I think The Lord is giving me a clear sign that I need to focus my prayers elsewhere. That latter part should read “I ENVY you.” So tired I can’t even recall my cardinal sins…I am such a bad Catholic. 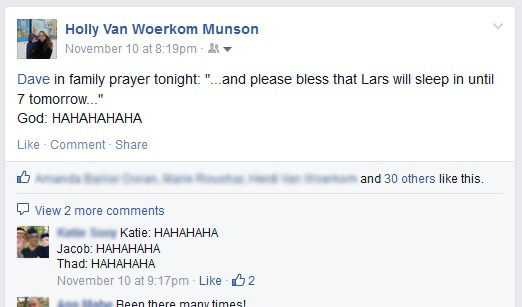 Haha, I will ask Dave to pray for you. But no need to convert, sister, Catholic prayers work just as well as Mormon ones! Unless you really want to, in which case you know the VW fam would be thrilled. Anyway, I hope that boy sleeps for you!! I am constantly amazed by you!